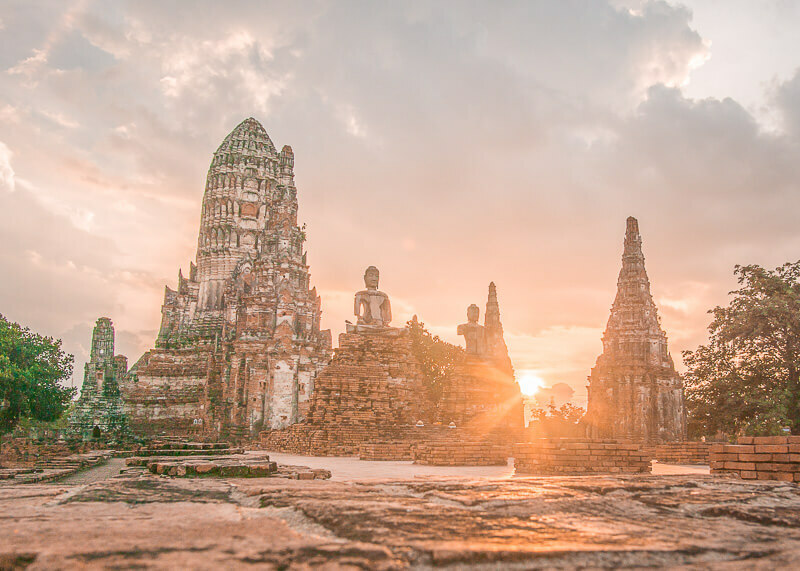 If you’re planning a trip to Ayutthaya, you’ll likely come across tips about making a day trip from Bangkok to this ancient capital. 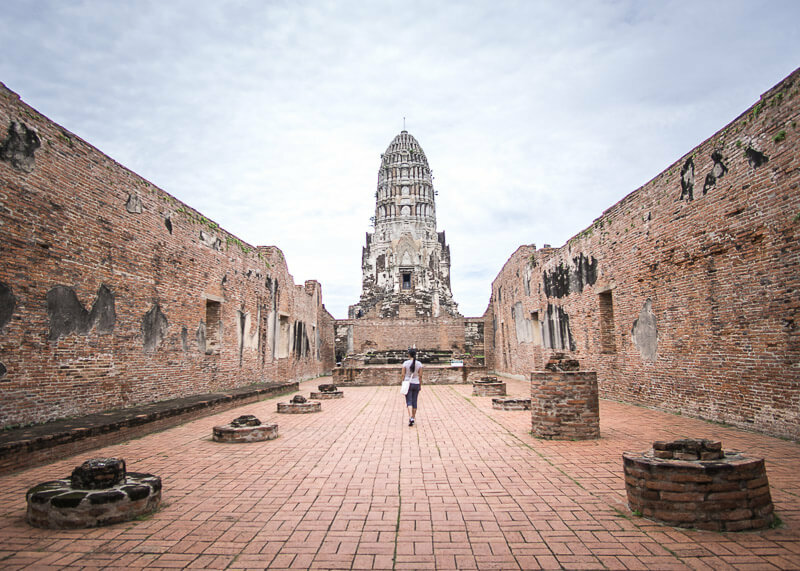 One day in Ayutthaya… are you kidding me? Where do I even begin to talk about how much of a disservice you are doing to yourself if you restrict your time to one day? 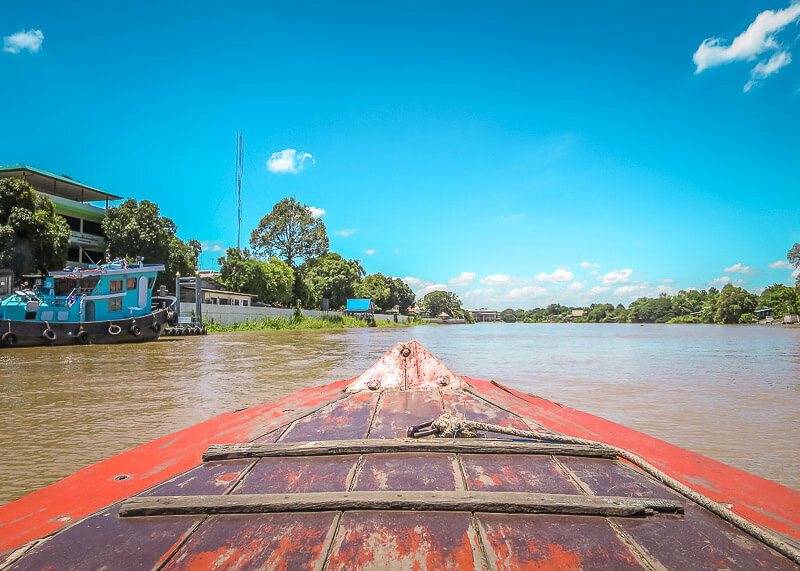 Not only does it take almost two hours to travel to Ayutthaya from Bangkok, but there’s a lot to see! Trust me when I say this, you will feel rushed and won’t enjoy your time in the city. And you’ll be visiting the temples when the crowds are in Ayutthaya too! Not only that, but you’ll miss the most beautiful part of the day, sunset! 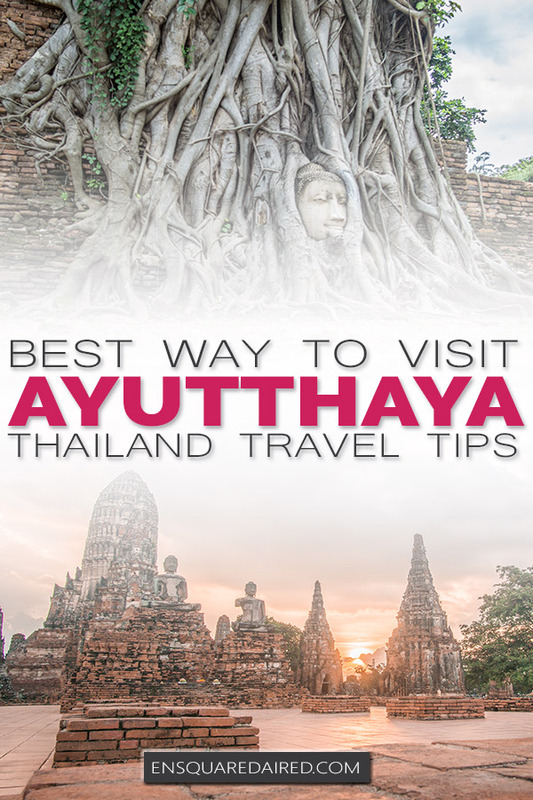 Here are some tips about Ayutthaya if you’re planning to visit this beautiful city. That is the best way to explore the city. 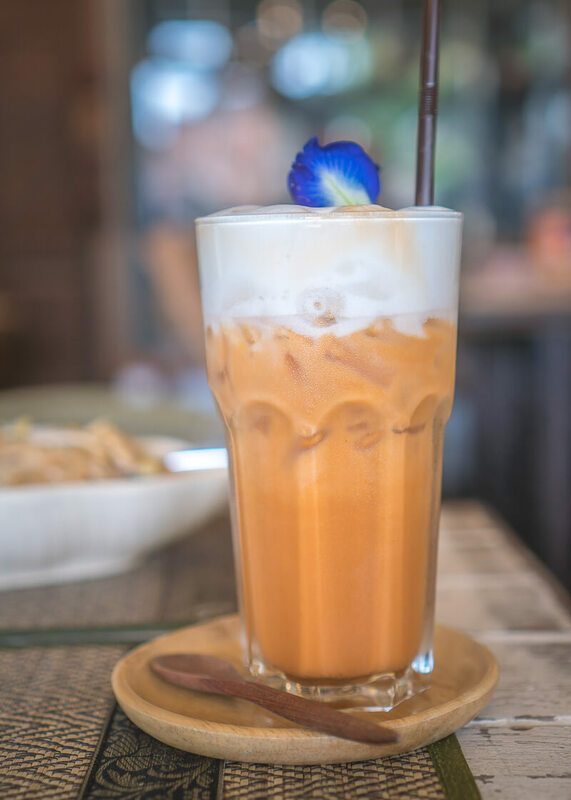 Not only is there lots to see in Ayutthaya, but it’s so hot in this city that you will need to incorporate lots of breaks! Believe me when I say this – as someone who can spend 10+ hours exploring places to no end, the sweltering heat in Ayutthaya wore me down. So much so that I’d sit in the shade and try not to move to avoid overheating myself. I was so hot that I wished I was like those touristy people who brought along an umbrella (pro tip: bring an umbrella to shelter from the sun). 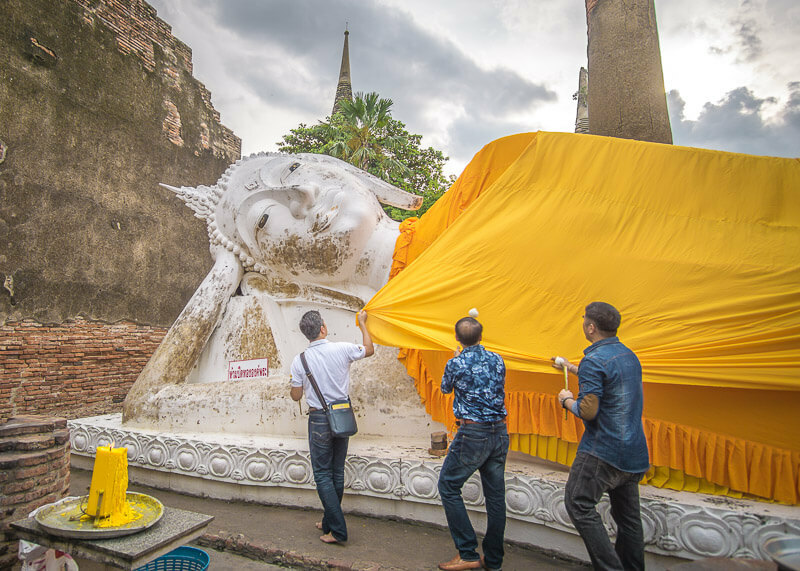 Here is our experience during our four days in Ayutthaya. That might be overkill for some people, but we were travelling for a year, and we had time on our hands. 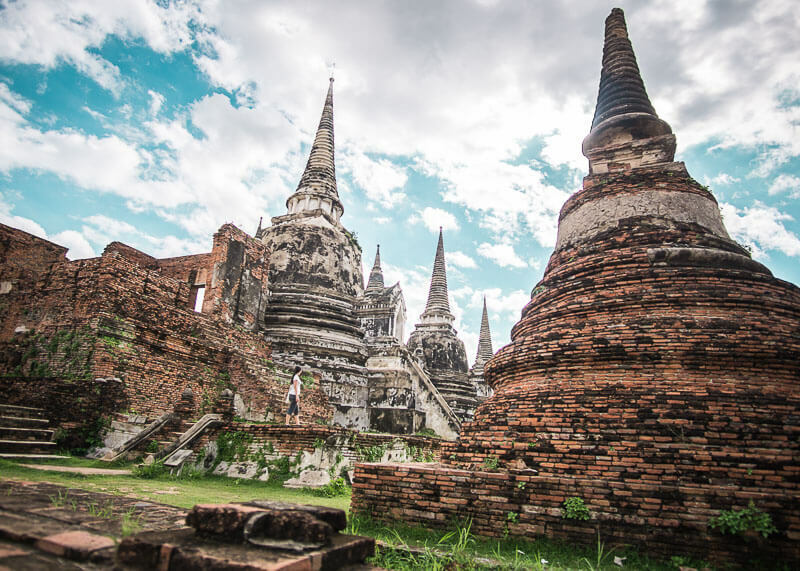 Our adventure to Ayutthaya Historical Park begins from Bangkok! We arrived from Bangkok to Ayutthaya by train during our second month of full time travel, and we were ready to get to our guesthouse! 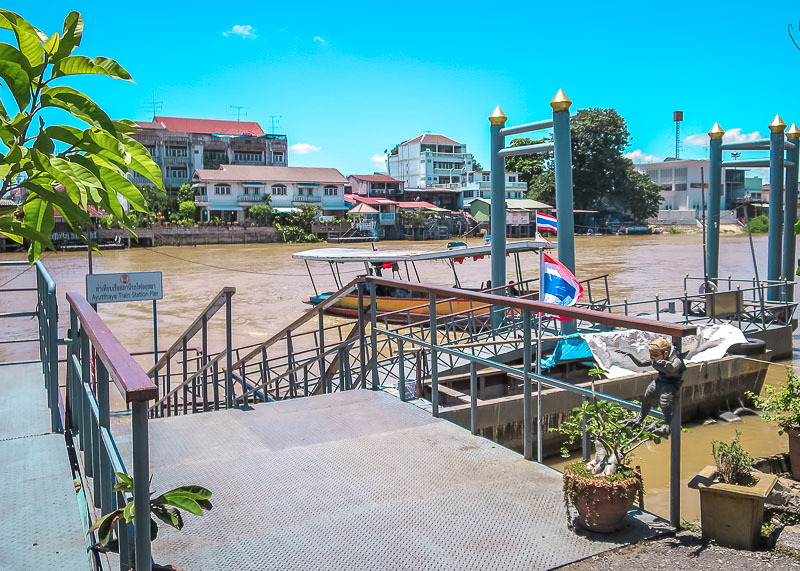 The train station is on the other side of the river, and while it costs around 100 baht to get to our guesthouse, we decided to save money and walk instead. Google maps says it’s a 15-minute walk, which isn’t so bad for us because we love walking, right? Find a reliable tuk-tuk driver who can drive you to the hotel. It is way too hot to be in the sun, and it took us 30 minutes to get to the guesthouse! Why? Because we had to stop every few minutes to cool down in the shade. The heat was incredibly unbearable. Mind you; we were walking around at 1 pm when the sun was at its hottest. 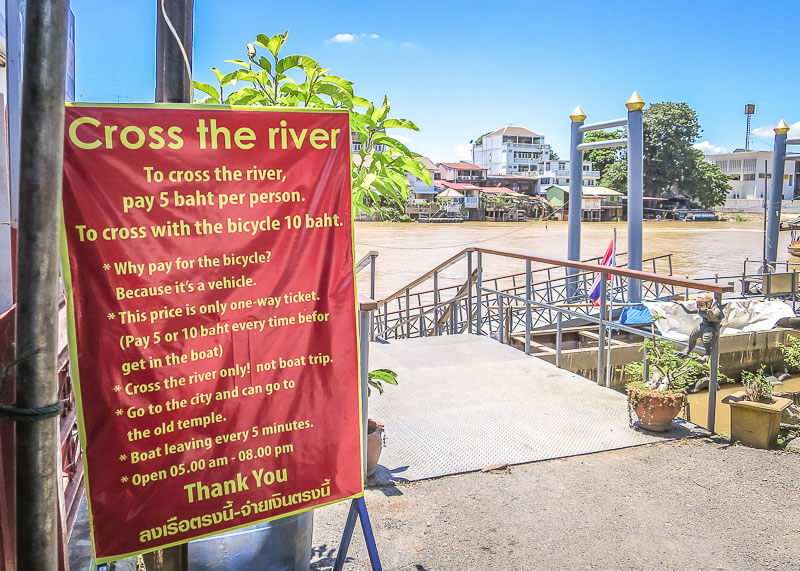 So after ten minutes of suffering in the sun, we reached the ferry terminal and paid 5 baht per person to cross the river. We had no issues with our luggage to cross the river. The pier is tiny though, and we only had a few planks that prevented our luggage from wading into the water. We also had to be careful to navigate our luggage to load it into the ferry. The ride was only two minutes to get from one side of the river to the next. Ayutthaya is a peaceful small town and becomes very quiet in the afternoon. We saw people napping on the ground of almost every home that we walked past during our long walk. Ah, the simple luxuries of life. 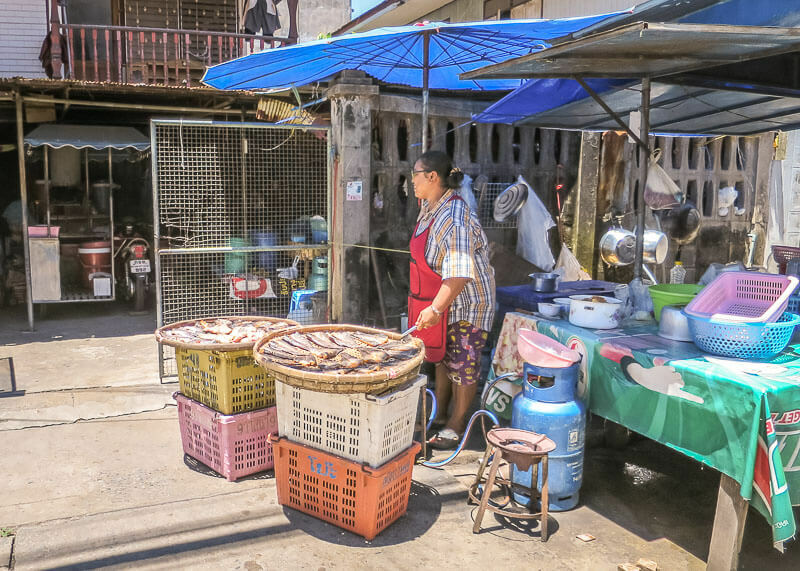 Watching a woman prepare dried fish. I helped my aunt buy fish and dry them in the salt and sun one summer… it’s a fun but long process! 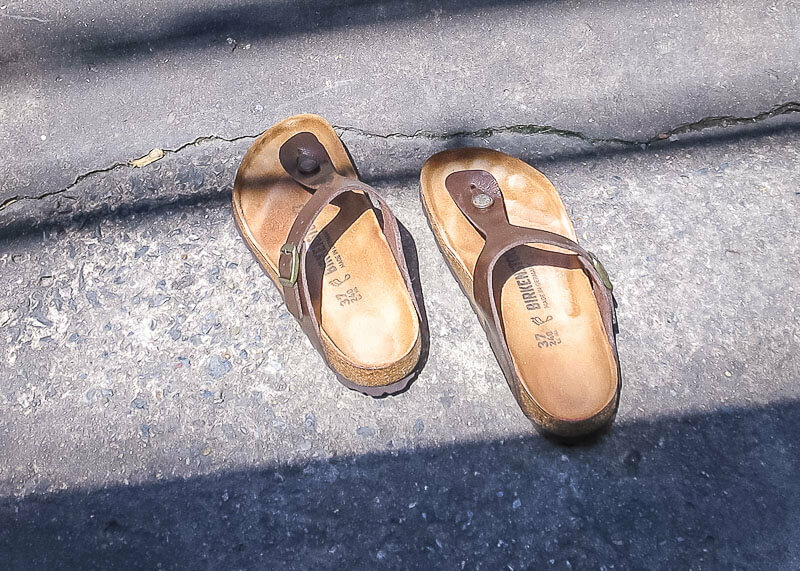 Remember how my sandals developed mold and could not dry because it was so wet and humid in Ao Nang? Well, my shoes dried in no time in the hot Ayutthaya sun! I left my sandals in the sun for two minutes, and they became super toasty afterward! Because it was hot as heck, we took a much needed two-hour nap. We finally woke up at 5:30 pm to see the temple ruins on our first day. Despite the fact that it was 5:30 pm, we were still sweating like pigs thanks to the heat. Ayutthaya is that hot. We spent our first day scouting the area and visited the first temple ruin, which was so beautiful! I couldn’t believe that I was standing in front of what once was the largest city in the world! 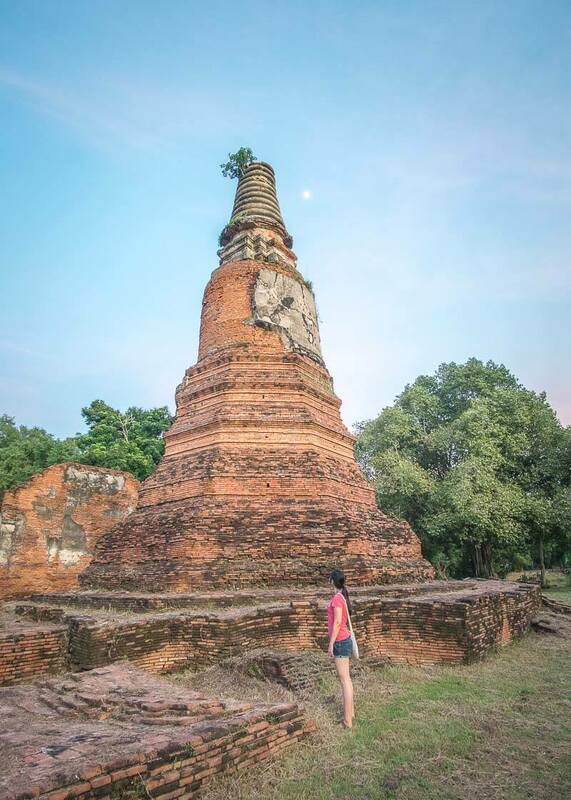 Why Burmese people, why did you have to burn down Ayutthaya? Our first day of temple hopping was so fun but oh so hot (sorry, I can’t stop talking about the weather. It was THAT hot. I felt so jealous each time I saw a tourist with an umbrella to shade themselves from the hot sun). Thanks to the heat, we took our time temple hopping from 11 am to 5 pm. I am not exaggerating when I say the heat is unbearable! 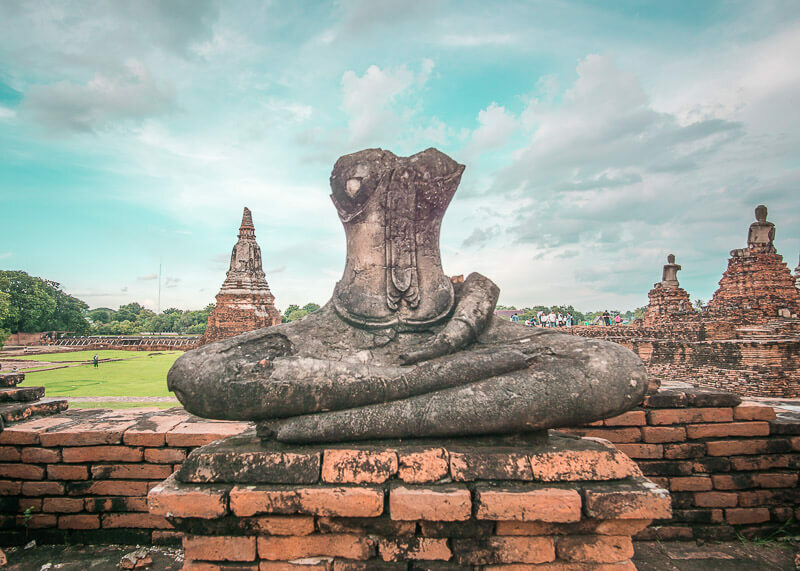 We had spent almost two months in Asia at this point of our year-long travels, and nothing felt as hot as Ayutthaya. It could also be because there’s no air-conditioned place to take refuge in or a break from the heat. The only time we took a break from the heat was in an air-conditioned washroom! We were at Naha temple, and we had a choice of using the bathroom for 10 baht or 5 baht. The difference is that the 10 baht had air-conditioned and toilet paper, so we splurged. That mini air-conditioned break was heaven. During my midlife crisis trip (yeah, let’s just call it that), I spent six weeks travelling around Asia. During that time, I met two awesome girls who told me about their Thailand trip where they were going to visit all the hotspots in the country. 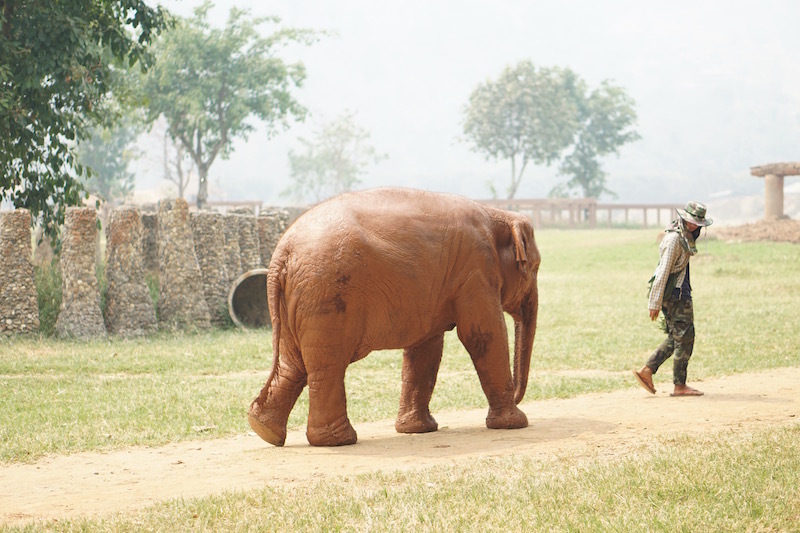 I was so inspired by their travel plans that I said to myself that one day, I’ll spend a month exploring Thailand. 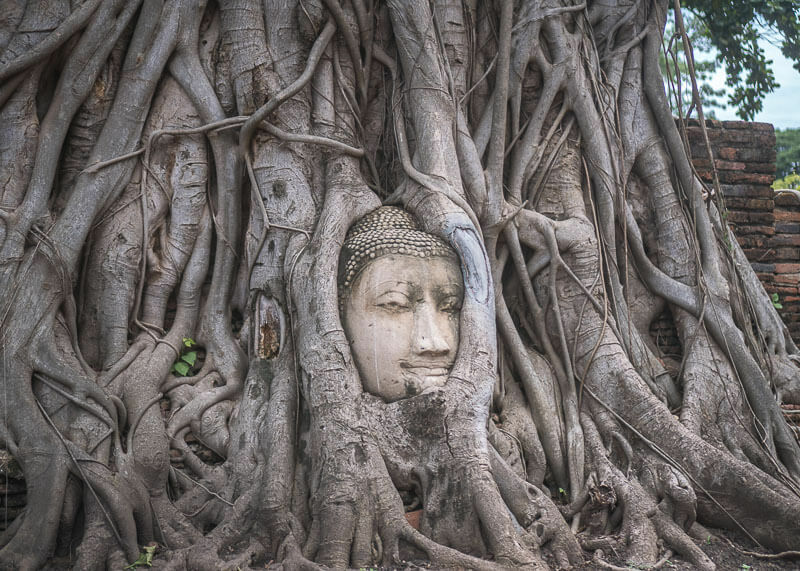 The Buddha head in the tree is the very reason why I wanted to visit Ayutthaya. It was such a magical feeling to sit in front of this Buddha and admire the details of the statue. Wondering what was in this very spot before the tree started to grow around the head got my imagination running like a madman. That feeling of sitting there, with nothing but me and my imagination is something I will carry in my heart forever. 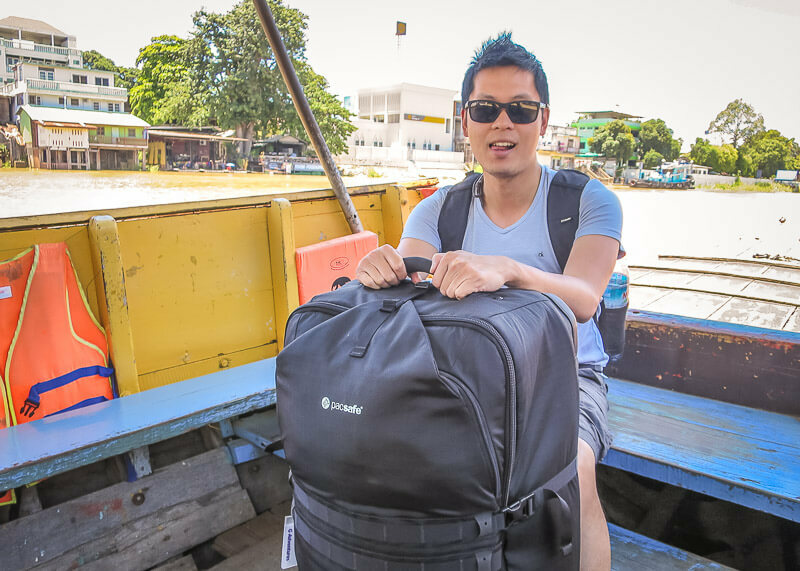 Before my trip to Ayutthaya, I was excited by all the photo opportunities that I will be taking in this city. But never once did I think about how I would feel during this trip. It was breathtaking. I couldn’t help but wonder what the buildings and the city looked like before the Burmese invaded Ayutthaya. It’s sad to hear that they burned everything to the ground. Were their heads adorned with gold? And where did the Burmese go with their loot? Myanmar isn’t that close to Thailand and is quite a distance to travel. Why did they invade Thailand? I wondered how the people felt during the invasion. Scared? Helpless? Confused? Whatever happened to the lives of the people who lived here? 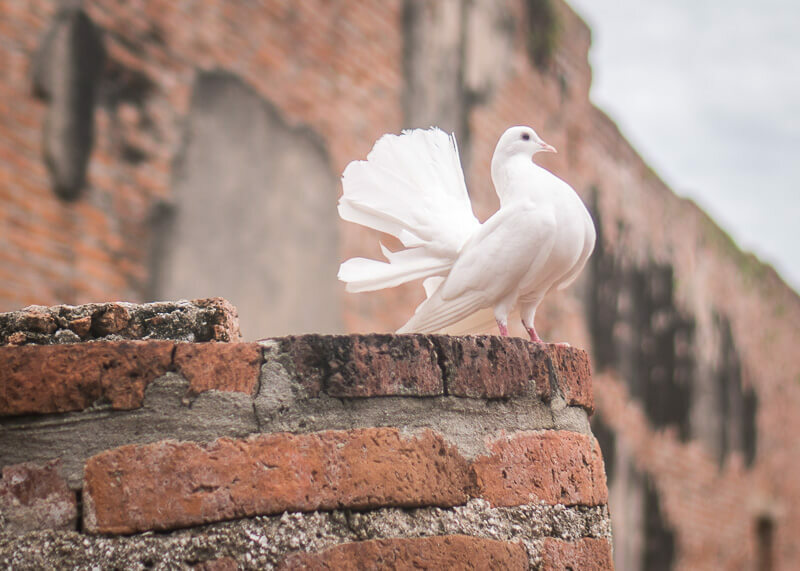 I imagine some died, some survived while others left Ayutthaya. I read somewhere that many survivors also became slaves in Myanmar. So sad. But what else? I want stories. I want to know more. How did this city rebuild itself? Are the descendants of the people from the 1700s here today? I wonder what it’s like to live in a place where family roots extend back to the 1700s. I will never experience that. Sadly, the knowledge about my family tree ends at my grandparents on both sides; I don’t know much about my history past a few generations. 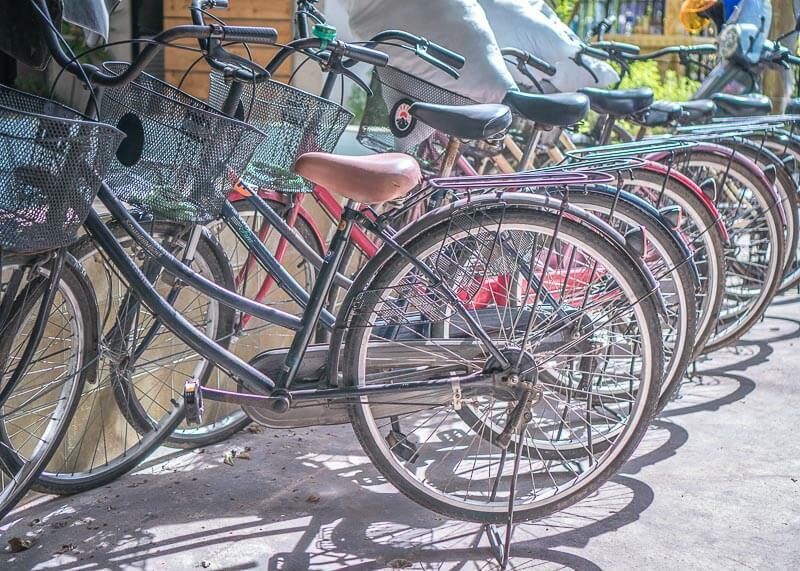 Biking around Ayutthaya was so much fun and reminded me of the days when I used to bike with my cousin in Asia. Where we come from, there are no streetlights, so biking past sunset was really really dark. There were only stars lighting our path and the occasional light from a passing motorbike. 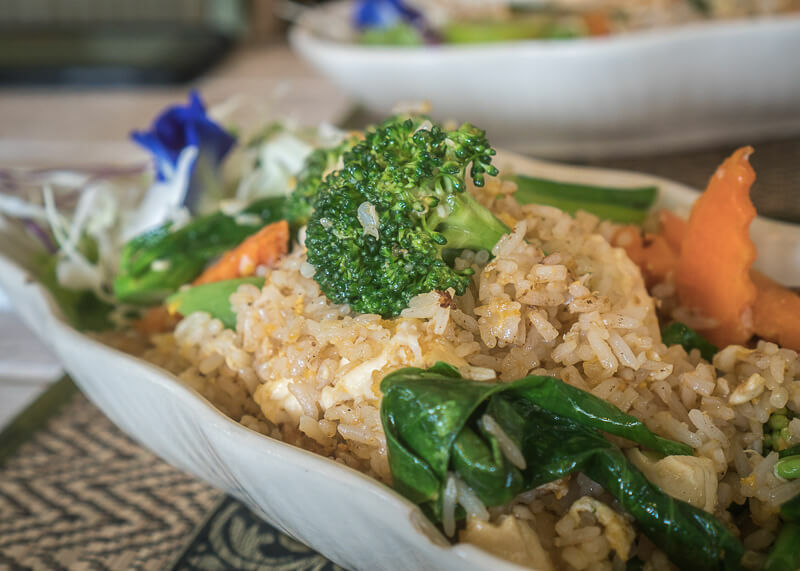 Because my stomach was still feeling inflamed thanks to that spicy noodle soup from Phuket, we were super selective on where to eat and only stuck with TripAdvisor reviews (I know I know, bad way to explore food). We ate at Coffee Old City. 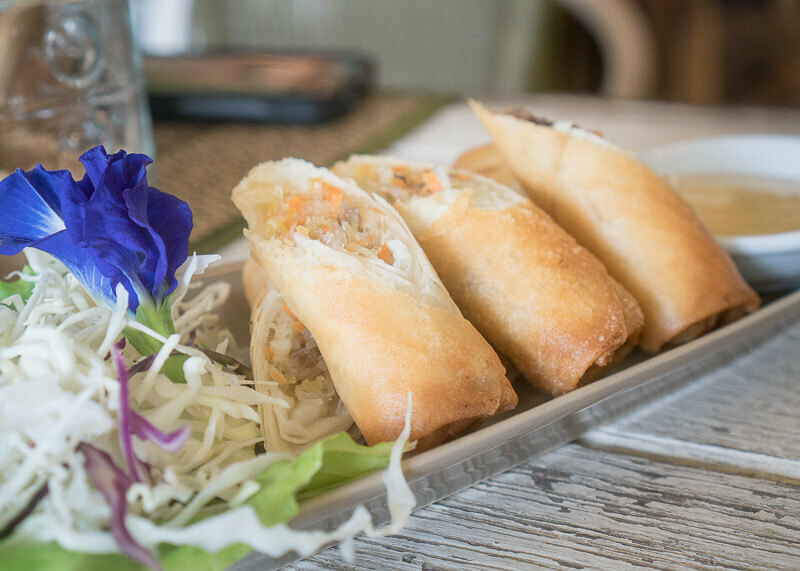 The service is excellent and the food was pretty good. 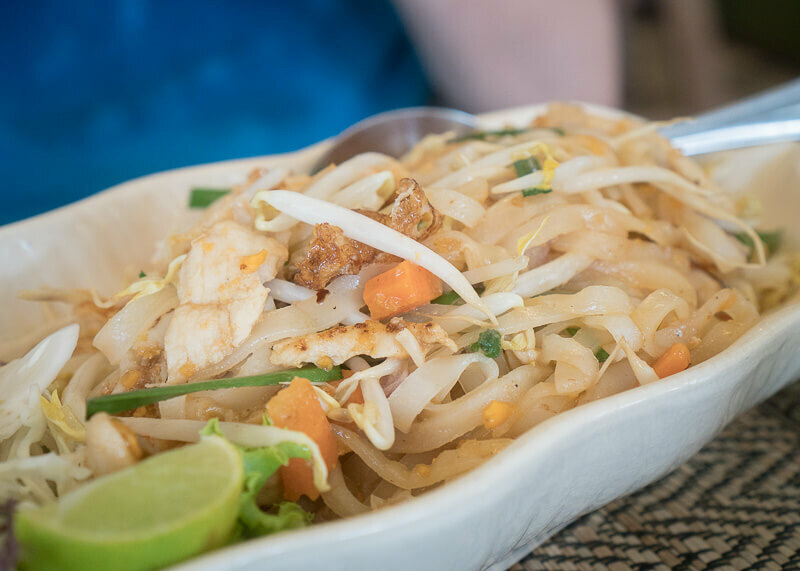 Pad thai at Coffee Old City. We ate here every day! I watched the people pray to the Buddha, and I want to take part in the ceremony, but I’m a little scared. Afraid that I will make a mishap and do something that offends them. While I call myself more spiritual than religious, my family is Buddhist. And so seeing people pray to the Buddha is familiar to me, but I always had my parents to guide me. These are the moments when I feel like I’m Asian, but not entirely Asian. I’m Canadian, but not fully Canadian. So who am I? Somewhere in between, never fully identifying with just one culture. 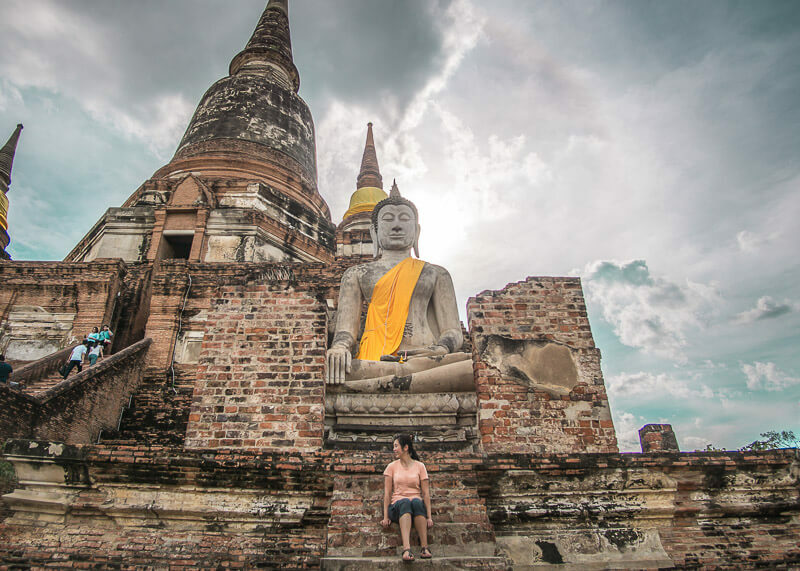 Spending a few days in Ayutthaya Thailand is the best way to see the city. Do you believe me now? As you can see in my post, we had the chance to really take our time and see Ayutthaya at a good pace. 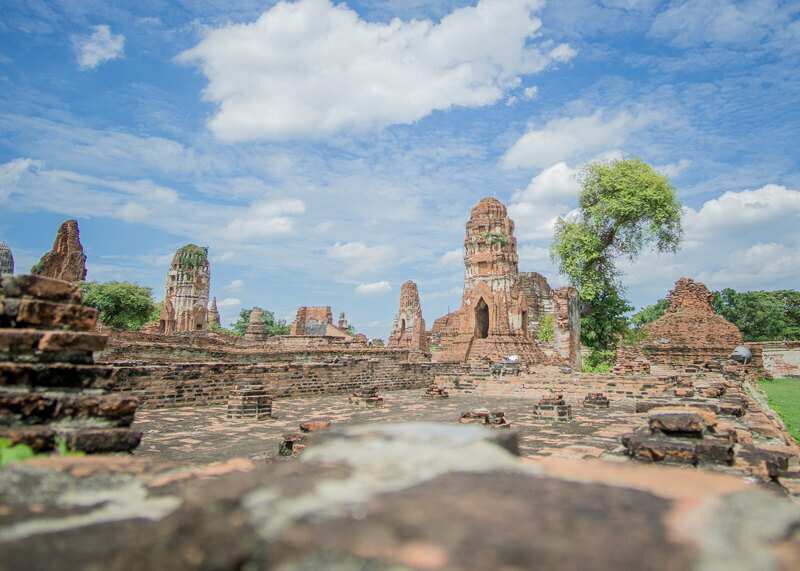 In my opinion, I recommend spending a few days in Ayutthaya to explore each temple. 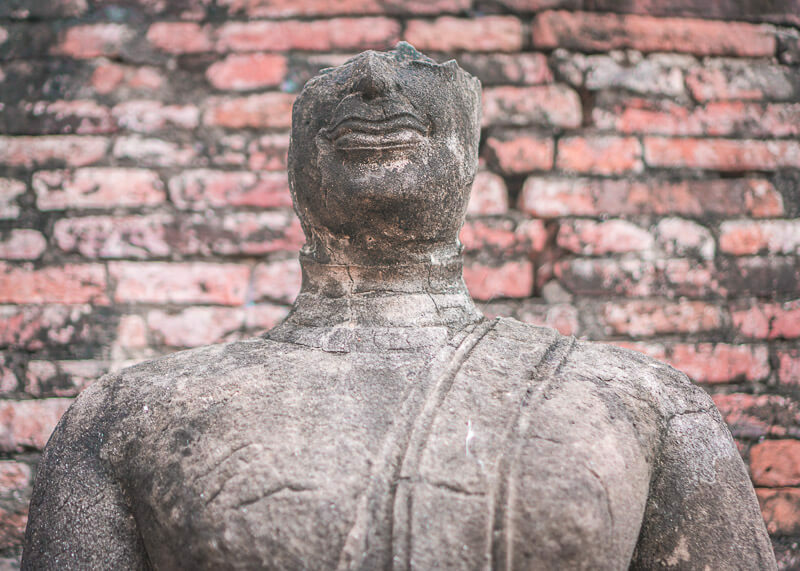 Ayutthaya was one of my favourite stops in Thailand. Glad to hear that you had the Buddha Head In The Tree all to yourself and Gary. Must invest in an umbrella! It’s been almost eight months, and we’re still surviving without an umbrella (adds weight, haha!). We bought raincoats from the dollar store and so far, it’s been serving us well! Im planning my trip to Thiland in Dec and WAS planning 1 night in Ayutthaya lol. 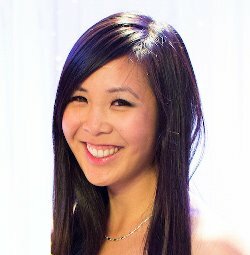 I changed my mind thanks to your post and have some questions. 1. How many temples did you look around for 4 days? haha, I am glad to hear! Keep in mind though that I was travelling for a year and buffered an extra day in Ayutthaya. If you are on a tight schedule, two full days to see temples in Ayutthaya should be sufficient. This was great information, I’m heading there this weekend, but I will only have 1 night to catch sunset. Can you recommend a good temple for sunset?